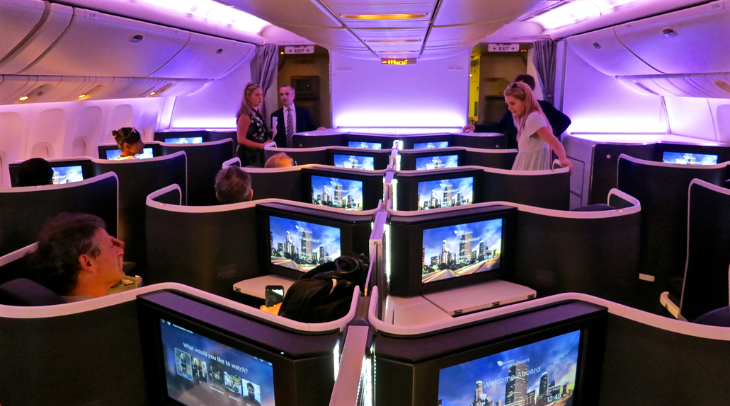 When we wrote about Virgin Australia’s fabulously re-furbed B777 in May, only one of five planes had undergone the transformation. The carrier put off the “official” launch until this week, hosting a big to-do in Los Angeles to which TravelSkills was invited. As of this month, three of Virgin’s five B777s are re-done and the two remaining will be finished by September, said CEO John Borghetti at a press conference onboard one of the big birds parked out by the beach on the western edge of LAX. 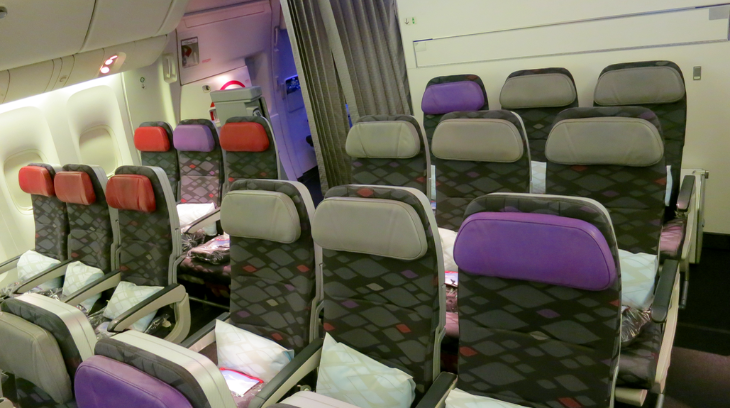 Virgin flies its B777s between Sydney, Brisbane and LAX and also on Sydney-Abu Dhabi. What’s really nice about this refurb that Delta customers can earn and burn SkyMiles on when flying on this gorgeous bird. 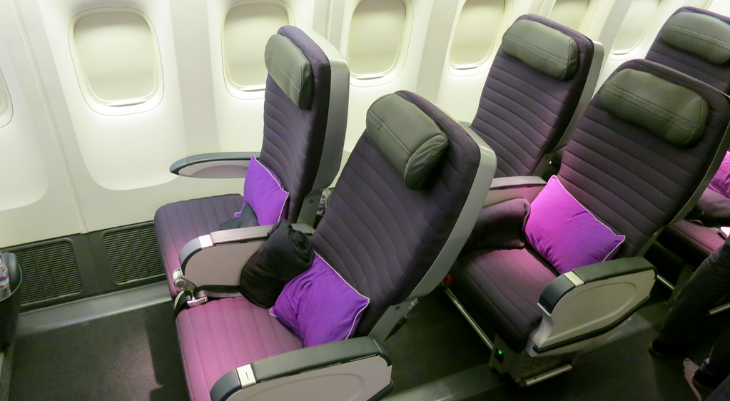 Rates can be freakishly high (or non-existent) when redeeming SkyMiles for Virgin Australia business class. Economy class roundtrips on Virgin go for around 90,000 SkyMiles. 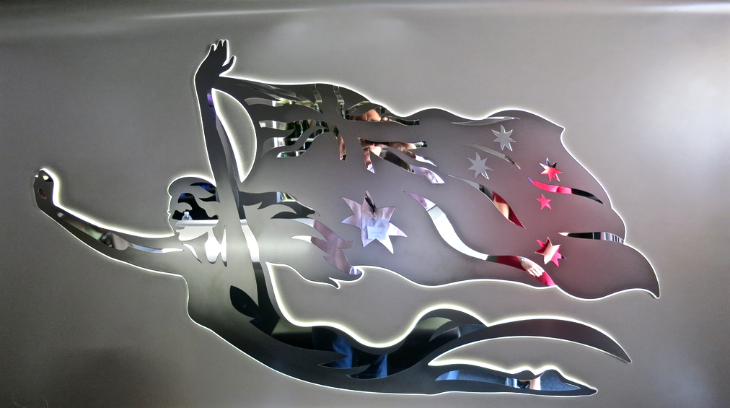 Virgin America Elevate members can also earn and burn points when flying Virgin Australia. Roundtrips go for 40K in economy, 60K in premium economy and 80K for business class. Fares: Checking September roundtrips today, business class flights between LAX and Sydney (or Brisbane) are running around $5,300, premium economy is $2,100 and economy is $973. What I found most interesting about this look-see was the emphasis Virgin Australia puts on making a good visual impression— something that you see across nearly all Virgin brands. At the onboard press conference, Borghetti described how Virgin’s design team strives to make a striking visual impact as soon as the passenger boards. He said that if the plane is pleasing to the eye right off the bat, and that there’s a certain “wow factor” when boarding, it puts the passenger in a positive “head space” which is likely to carry through the rest of the experience. See what he means when you see the Google Streetview below. 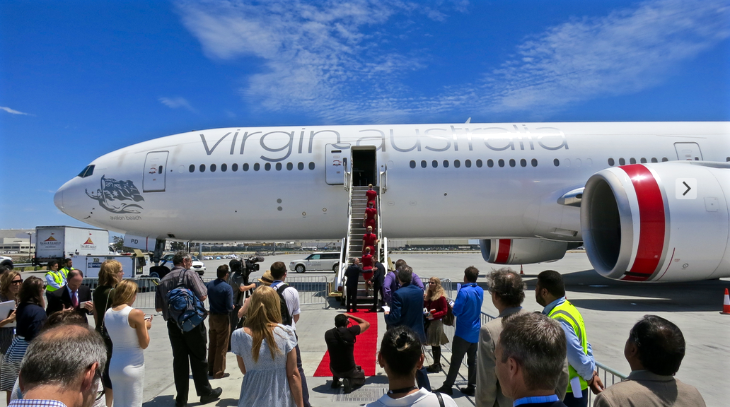 While we included most of the key details of the B777 in our previous post, this event provided the opportunity to get up close and personal with what Virgin says is now best in class among carriers serving the U.S.-Australia market. 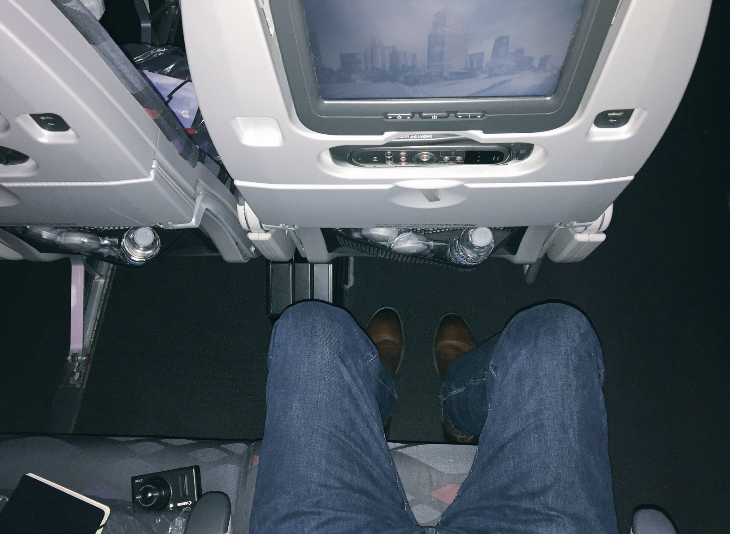 Virgin was happy to spout plenty of superlatives about its new business class. For example, they said the seat is the widest (28 inches) and among the longest (80 inches), and its video screens are the biggest (18 inches). Every seat offers aisle access. 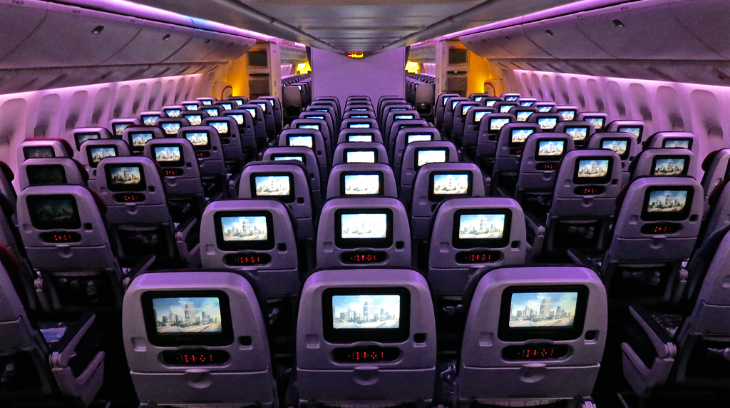 Regrettably, these planes won’t have onboard wi-fi until mid 2017. In addition, we noticed plenty of easily accessible nooks and crannies for in-seat storage and a large flat workspace. 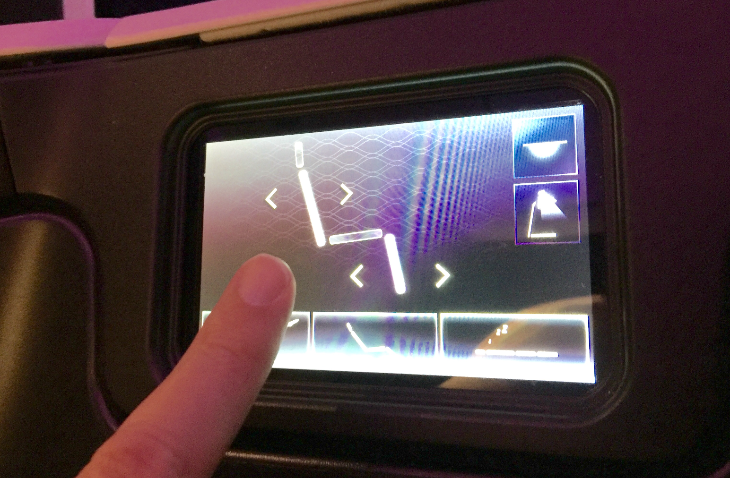 An unusual electronic touch screen controls recline. Flight attendants provide memory foam mattress covers and turn down service while passengers change into pajamas in the lavs. Plus there’s a Nespresso coffee maker in the galley. Even better- there are 37 business class seats in the new configuration. Previously, there were only 34. The new premium cabin offers 24 seats with 41 inches of pitch, two dedicated lavatories, “business class inspired” food and beverages served on china and glass. Seats are configured 2-4-2. This cabin also has its own self service snack bar and refrigerator. Another interesting nugget from this news conference: Virgin’s B777 has more lavatories per passenger that any other plane in the market– a ratio is one lav per 12 passengers, which is important on those 14-hour LAX-SYD slogs. 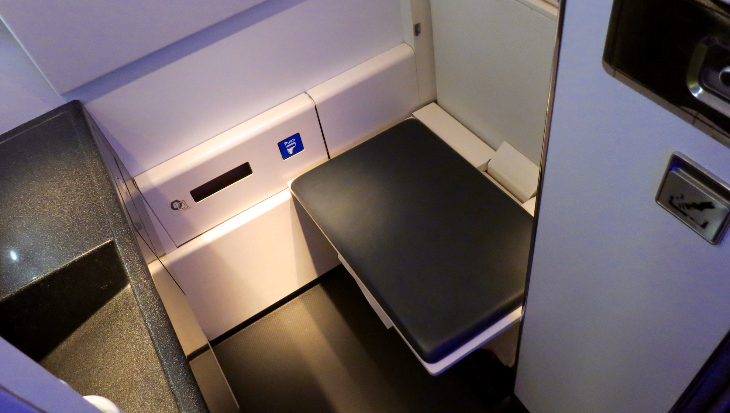 Both business and premium cabins have two each. 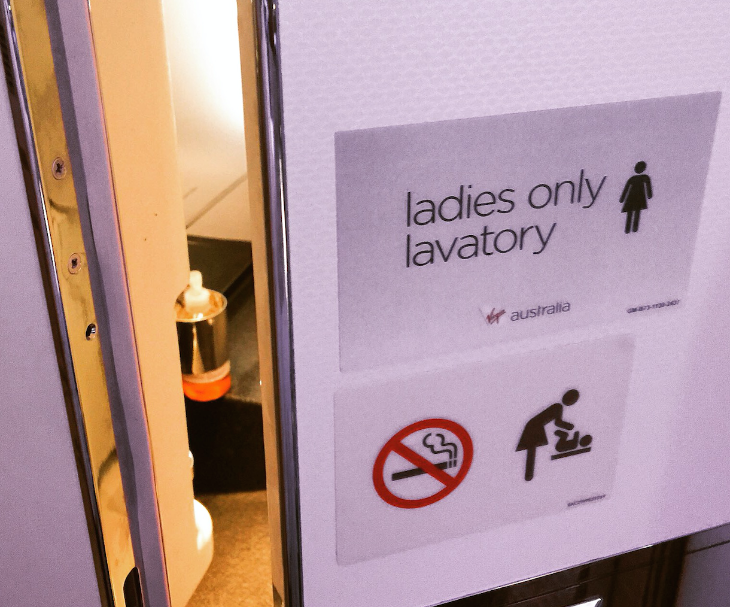 This plane also offers a “ladies only” lav, with a smart leather bench that folds down over the toilet where one can sit while changing into or out of the pajamas Virgin supplies to business class passengers. There’s is also a full length mirror in the ladies-only lav.